I won't describe what I look like. Whatever you're thinking, it's probably worse.August (Auggie) Pullman was born with a facial deformity that prevented him from going to a mainstream school—until now. He's about to start 5th grade at Beecher Prep, and if you've ever been the new kid then you know how hard that can be. The thing is Auggie's just an ordinary kid, with an extraordinary face. But can he convince his new classmates that he's just like them, despite appearances?R. J. Palacio has written a spare, warm, uplifting story that will have readers laughing one minute and wiping away tears the next. With wonderfully realistic family interactions (flawed, but loving), lively school scenes, and short chapters, Wonder is accessible to readers of all levels. 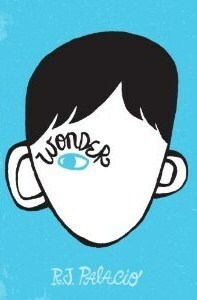 Wonder has been on my bookshelf, unread, for 4 years! How do I know it's been exactly 4 years? Because I purchased it before the little bookstore I worked at closed it's doors for good. I feel like after reading this Wonderful novel that I have committed some monstrous book crime for letting this book sit on my shelf that long going unread. I am so ashamed of myself! I feel like I need to be walking down some book-plank begging for forgiveness! Now that I've confessed, let me move on and tell you just how moving, heart-warming and truly beautiful this novel is. We are introduced to August "Auggie" Pullman, a young boy born with a facial deformity. Being somewhat sheltered and home-schooled his entire life, his parents have decided it's time for him to attend school. We are then taken on the journey of Auggie's first year as a 5th grader in a real school, with real students, and real teachers. There are some gut-wrenching moments when we are reminded how cruel others can be(not just children) but what shines even brighter is the kindness in others. Love is truly louder. What makes this book a true gem, a real wonder, is the perspectives in which the story is told. We hear not just from Auggie but some of the other marvelous characters. Auggie is not the only character that is faced with setbacks, the trials and tribulations of school, life and growing up. We hear from Via, Auggie's loving, overprotective sister. Jack Will, Summer and even Miranda, a friend of Via's who feels she has the right to claim Auggie as her own as well. Wonder can be enjoyed by readers of all ages. Not only it is just simply a beautiful story, but I can assure you that everyone will be able to relate to or find a closeness with something in this novel. Whether you are the new kid in class, a parent who is unsure if you're making the right decisions as a parent, a sibling, friends that may be drifting apart, etc. Wonder is so colourful and you will surely find an understanding or bond with someone or something. What I found to be the true takeaway of this novel was the strength and kindness in Auggie. It is not a story about Auggie being an underdog, it is story about love, friendship, and growth.